Have you ever wondered about what it takes to make original animation videos from scratch? It’s not as hard to do as it may first appear. This article tells you my thought processes behind making this type of video. Reggie, this site’s proprietor, wrote an email recently suggesting to the correspondents to this site that it would be nice if some of us wrote up some “The making of…” articles on how we go about making some of the videos that we publish to our YouTube Channels. The whole idea behind the concept is to give readers some ideas to take away to use on their own projects as well as to give an insight into how things are done in the process of making these videos. I gave the suggestion some thought and decided that it’s a good idea especially since I make a lot of original animated sequences totally from scratch. However, rather than creating something totally new for this article, here in this article I will just describe how I made a video that I created awhile back. The video that I chose to highlight for this article is a short one and honestly, didn’t take long to do. This makes it an excellent showcase to illustrate exactly how I work and the amount of work it takes and the thinking that goes behind projects like this. Most people who make MMD videos used prepackaged motions, thinking that making motions from scratch is really difficult. In actual fact, it isn’t all that hard. It does take a lot of work, to be truthful, but once you’ve got a “method” under your belt, it really isn’t all that hard. Anyway, I made this video over the course of a weekend and for something that is only about a minute and a half long, that’s a reasonable investment in time for the final outcome which I personally was well pleased with and judging from the comments I’ve received, others who have seen this video felt the performance was very reasonable too. It started out because I got bored and was looking for something to keep me occupied productively, plus the fact that I saw and downloaded a gorgeous edit of Teto by Yami Sweet. 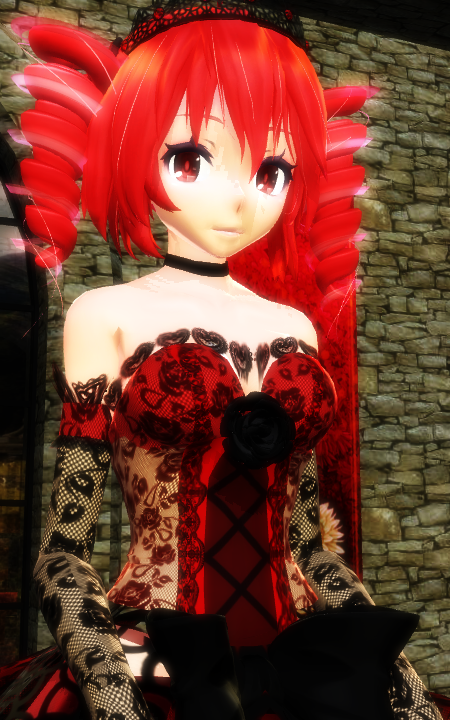 That would be the lovely model shown below: Passion Teto. I pick my models for my videos very carefully and once I’ve chosen one to use it almost invariable gets my personal “treatment” in the PMDe as I am very particular about how a model functions. This model needed some minor corrections to work the way I wanted her to work plus I added some customizations to it to make it easier to animate her fingers. I hate posing fingers, so I developed a system to make it easy to animate fingers. 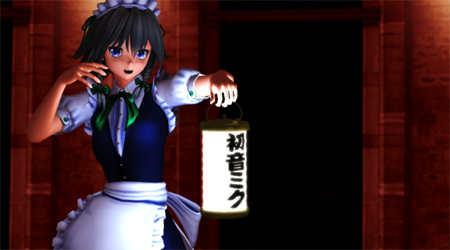 If you want to find out exactly what I did to her hands, Iyazoi Sakuya shows you how at the end of the link if you click on her picture below. Once the model was set up, the next project was to select a song and I had one at the back of my mind for sometime so I dug that out and just extracted the segment that I wanted using Audacity. I didn’t want to do the whole song, just a part of it. Sometimes, short is better and honestly, it’s a lot easier to animate something a minute and a half long rather than the whole thing that could go on for 4-5 minutes. I’ve done full interpretations of songs but those kind of projects can take up to a month to do. With the song edited the next thing to do was to create the lip sync for the performance. I always use MOGG’s Face and Lips to create my lip syncs because it makes the process really easy. In fact, all of Teto’s facials were done using this software because of the fine control it gives you over the behaviour of each facial. With my animations, nothing is random. In order to create, credible, lifelike performances, everything that she does is precisely designed. When I create my facial and lip sync motion set, I design them to bring out the “character” of the performer as I interpret her. This is one of the reasons why I don’t generally share my motions. 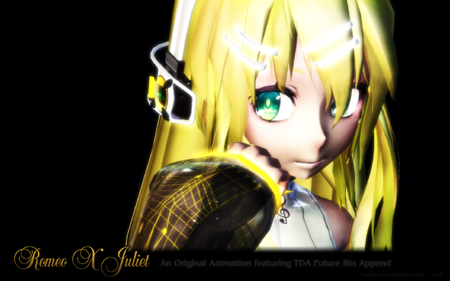 The character interpretation is specifically for a specific manifestation of a selected Vocaloid model. If you watch Teto’s facial expressions in this video, you should get a very clear idea of her character as I interpret her. Her expressions are designed to communicate not only the meaning of the words behind the song but the persona behind her character. With these thoughts in mind, creating the motion itself for the performance was really easy. She didn’t need to move much, but then again, she did need to move. We communicate with our hands; I made liberal use of this fact in developing her performance. So one might ask how I go around developing her movements? The answer is actually very simple. When I design my motions I always start off with the lip sync and facial set. Once this is done I’ve got a blueprint of my character’s behavioural traits. The rest is then left for the character herself to “tell me” how she wants to move. In other words, the process is totally intuitive – a sort of inner dialog between myself and the model I am animating. I let the character interpret the song and this in turn dictates her movements. This needs to be done for each stanza of the song but they naturally link together so by the end of the process you have a complete performance set which looks very lifelike and which is also unique to the character. This is just like what it would be if the song was performed by a real person and it is these elements that makes Teto, “Teto” in the performance. These elements are deliberately designed into her expressions and movements. There is an element of tongue-in-cheek built into what she does and this makes her more “appealing” as well as credible. There is also an element of cheekiness which makes the whole performance “fun” to watch. Teto, being “Teto” can be a little playful and coquettish (moe) and these characteristics do come through in the motion designed for her; but it’s subtle so you really need to watch carefully for these elements. It’s deliberately done this way because real humans communicate also through nuances or in more common parlance: “body language”. It also makes her “adorable”, in some parts of the performance, it makes you want to just hug her. Using these methods, she is quite capable of “engaging” the viewer in a very lifelike, personal and appealing manner. With the motion out of the way the next thing to do was to set up the performance environment. Here simply I used one of my own stages, but I choose one that best matched her attire. If you look carefully, Teto and the stage look like a part of one set. It’s almost as if they were made for each other. Plus the stage has that interesting mirrored window at the back which helps makes the overall scene much more lifelike. That effect was done using an MME that was specially adapted to work for the stage and is offered with the stage as standard. Which leads to the MME suite that I chose to use for the video. I’ve covered the topic of creating photoreal presentations using MMEs in MMD in other articles so won’t go into any detail about them here. Suffice to say here, the MME suite used here was intended to accentuate her lovely dress and to make it look as “real” as possible. This was helped by the fact that the edit was beautifully done in the first place. As a part of this process, the lighting was tweaked to help really bring out the dress color and characteristics; and to help both Teto and the dress stand out from the background I used global shaders to increase the contrast and the strength of the primary colors. Finally, I made the camera motion. In actual fact, I develop the camera motion as I develop the motion, but fine tune it at the end. When you make your own motions you have a tendency to want to show everything. That, however, generally isn’t a good idea. What you want to do with the camera is to “interpret” the performance correctly. There is an element of Teto “playing” to the camera in the performance, but the final reiteration of the camera motion is to fully engage the viewer. Simply put, the camera motion needs to satisfy a lot of criteria in a short amount of time. What I actually did with the camera was to first establish the scene. Next it introduces the performing character and then quickly pulls the viewer into the performance and works to develop a level of intimacy between Teto and the viewer. All very subtle, deliberate and highly effective. 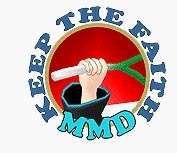 The video was then rendered in MMD using the Xvid codec and was done in hi-resolution to ensure the best possible viewing experience. The video actually had to be rendered three times as tweaks and corrections needed to be made – always watch your own videos with a critical eye so that you can catch errors that may have missed your attentions earlier. Thanks for reading this “wall-of-text”, but hopefully it’ll give you a good insight as to how an original animated video is made plus the amount of thought and work it takes even to create a 1:16 minute sequence. Don’t be daunted though, it really isn’t that hard and bear in mind, I am neither a professional animator nor video producer. 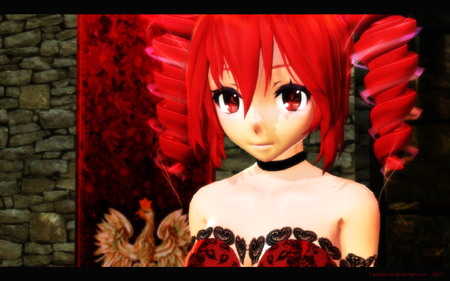 Just like you, I picked up a copy of MMD, and with a lot of effort I learnt the skills to do something like this and believe me when tell you this: It is well worth the effort. Anyway, a little later after the Teto version was made, I made the Japanese language version of this song. This time sung by Maddoktor2’s interpretation of Future Rin.